Traditional intercoms and public address systems are composed entirely of analogue electronics components but many new features and interfacing options can be accomplished with new intercom systems based on digital connections. Video signals can be carried as well as voice. Digital intercom stations can be connected using Cat 5 cable and can even use existing computer networks as a means of interfacing distant parties. 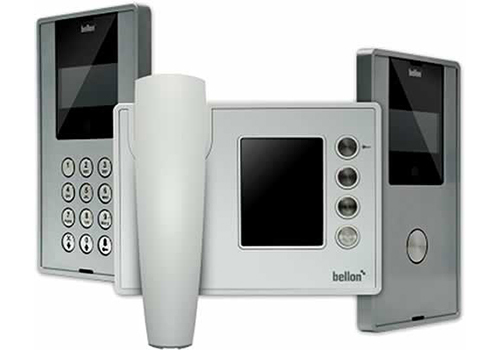 Many schools and office buildings now use audio / video systems to identify visitors trying to gain access to a locked building, and can be interfaced with the building's access control system. Intercom systems can be found on many types of vehicles including trains, watercraft, aircraft and armored fighting vehicles. Portable intercoms are commonly used by special event production crews and professional sports teams. Performing arts venues such as theaters and concert halls often have a combination of permanently mounted and portable intercom elements. Motorsports race track soften have both portable and permanent intercom stations mounted at critical points around the racecourse for use by race officials and emergency medical technicians. � Master Station or Base Station � These are units that can control the system, initiate a call with any of the stations and make announcements over the whole system. � Sub-station � Units that are capable of only initiating a call with a Master Station but not capable of initiating calls with any other stations (sometimes called slave units). � Door Station � Like sub-stations, these units are only capable of initiating a call to a Master Station. They are typically weather-proof. � Intercom Station � Full-featured remote unit that is capable of initiating and receiving party-line conversation, individual conversation and signalling. May be rack-mounted, wall-mounted or portable. � Wall Mount Station � fixed-position intercom station with built-in loudspeaker. May have flush-mounted microphone, hand-held push to talk microphone or telephone-style handset. � Belt Pack � portable intercom station worn on the belt such as an interruptible feedback with an ear piece worn by talent. � Handset � permanent or portable telephone-style connection to an intercom station. Holds both an earpiece and a push to talk microphone. � Headset � portable intercom connection from a belt pack to one or both ears via headphones with integrated microphone on a boom arm. Connects to a belt pack. � Paging Signal � An audible and/or visual alert at an intercom station, indicating that someone at another station wants to initiate a conversation. � Power Supply � Used to feed power to all units. Often incorporated into the design of the base station. While every intercom product line is different, most analogue intercom systems have much in common. Voice signals of about a volt or two are carried atop a direct current power rail of 12, 30 or 48 volts which uses a pair of conductors. Signal light indications between stations can be accomplished through the use of additional conductors or can be carried on the main voice pair via tone frequencies sent above or below the speech frequency range. Multiple channels of simultaneous conversations can be carried over additional conductors within a cable or by frequency- or time-division multiplexing in the analogue domain. Multiple channels can easily be carried by packet-switched digital intercom signals. Portable intercoms are connected primarily using common shielded, twisted pair microphone cabling terminated with 3-pin XLR connectors. Building and vehicle intercoms are connected in a similar manner with shielded cabling often containing more than one twisted pair. Digital intercoms use Category 5 cable and relay information back and forth in data packets using the Internet protocol architecture.